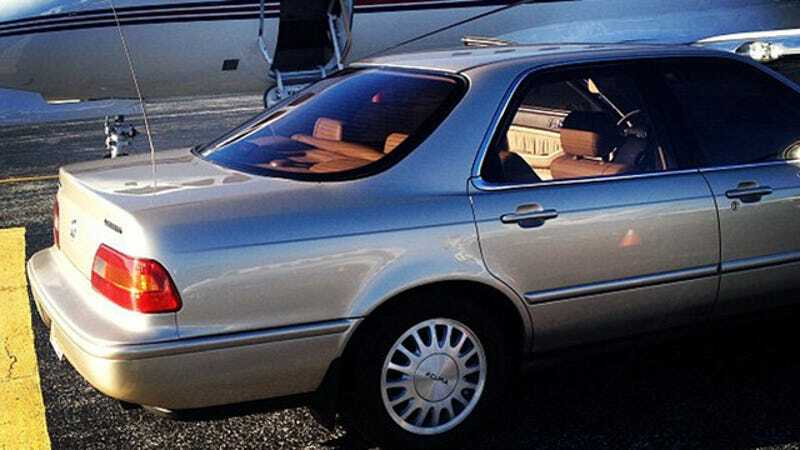 If there's any proof that Ludacris is a cool dude, or that Acura's glory days are behind them it's this: Luda still drives his '93 Acura Legend from before he made it big. Not only does Luda still drive the car, he's racked up over 240,000 miles on the thing. More than that, he poses it next to his private jet with the line "My plane & my 93 Acura Legend. It's doesn't get much more Gangsta than that. Lol"
That's what he said on Chelsea Lately a few weeks ago, as Reddit's r/cars recently pointed out. Chelsea Handler asked, "I just found out that you drive a 1993 Acura Legend?" Luda replied. This is the car that I've had way before all the commercial success. So I still drive it. It has like over 240,000 miles on the car. Chelsea pointed out that her drug dealer in high school had a black Acura, too. Luda was not dismayed. You know, I think the Acura Legend was the signature drug dealer car back around then. So it's a good thing. To recap: Not only does Ludacris still drive (and post pictures of) his car from before being famous, he openly recognizes its drug dealer cred. Try and imagine the same thing happening with a new Acura. You can watch the video of Luda's interview right here.